Free Printable Piano Sheet Music for Late Beginners, The Lake Pirates! 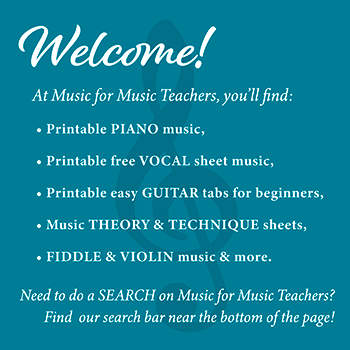 Free printable piano sheet music for late beginners. With a title like "The Lake Pirates," piano teachers are already way ahead! With this song, I sought to make the melody reminiscent of the Lake Town theme in Hobbit 3, The Battle of Five Armies. I have offered it to many students since I wrote it, and it has been well received. One is a teenager, old enough to be sporting a small mustache! Another has a tiny brother who is picking up the melody by ear, and was delighted to show me! Yet others are young girls who usually go for PRETTY songs. Please scroll down the page for the link to the free printable PDF. To help students struggling with the initial rhythm of the introduction, I used the words "FRO-do, SAM-wise and AR-a-GORN." That solved some problems with students who just couldn't remember to count, "ONE TWO THREE FOUR-and ONE TWO THREE..."
The left hand of this piece is mostly made up of open fifths, which makes it easy for beginning players to learn. stays on the bass note G (while changing to a G major chord). Additionally, there is the added complexity of the rhythm in this section (a welcome relief after the plodding "tee-tee TAH, tee-tee TAH, tee-tee TAH," etc. It is a good opportunity for counting practice. I plan to turn this piece into a duet, as well, with the simple melody written with big alphanotes for beginner piano players, so check back soon! I love the music from The Lord of the Ring soundtracks, and The Hobbit music as well, and so do many of my students! Remember, an AlphaNotes helper version can be found on my page Piano Music with Letters. Free printable piano sheet music "The Lake Pirates"